What's the sailing ship equivalent for “Full speed ahead!”? It was "full steam ahead" in the time of steamers. 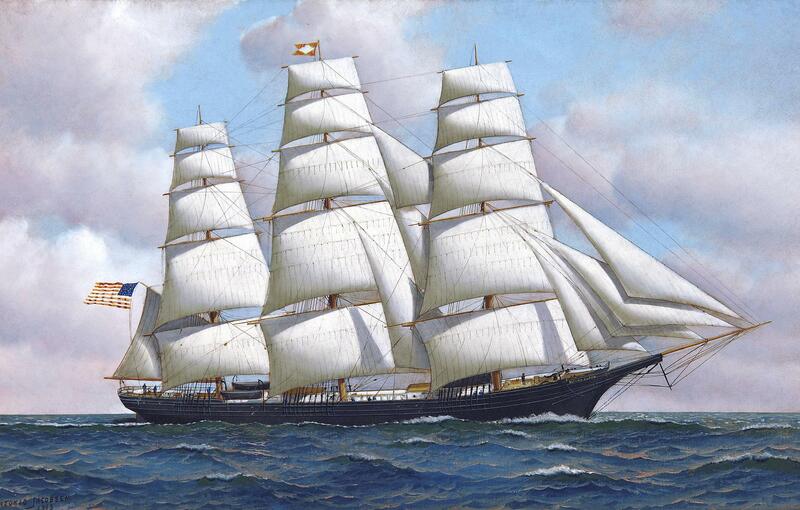 One of the last sophisticated sailing ships was the clipper. They were capable of crossing the Atlantic in something like 11 days. Had crews of up to 30 people. Pretty sophisticated stuff. The storm is over, the rain has slackened. Time to pick up speed. The captain spreads his shoulders and says ... what, exactly? These actions include letting out the ;reefs' which had shortened the sail, squaring up the 'yards,' tightening halyards, attaching sails. The ship could then be described as "under full sail." If they were 'running before the wind, the wind would be coming from directly behind the boat. Consider, Set all sail!, Crowd sail! Ngram, and Crowd on! Several other answers cover the extremeness of "All sail" or "Crowd Sail" etc. As anyone with sailing knowledge can explain there's no single on switch for the situation you describe. The sail to be set would be a matter of precision. The ship's officer on duty would want very specific things, and would give very specific orders. How strong is the wind? From which direction? Does the ship need to tack and does it have enough momentum to do so? Next, what sails were reefed or furled during the storm? It would be wrong to assume that a clipper would strip down to bare masts for a storm (a ship without steerageway is the equivalent of trying to balance on a bike without forward momentum). So an order to "Shake out", "loose", or "set" certain sails would be given. The closest catch phrase of the sort you're describing would be an officer delegating to someone else. "Prepare to make way" or "Get us underway" might be commands given to a responsible individual who was to use their own judgement regarding what sail was called for by the conditions, then he would give orders for the specifics. As well as descriptions of the different types, levels, and categories of sails that a clipper might be equipped with. To sailors, three things made a ship a clipper. She must be sharp-lined, built for speed. She must be tall-sparred and carry the utmost spread of canvas. And she must use that sail, day and night, fair weather and foul. He certainly doesn't say full steam ahead ... he would deploy more sail incrementally, because that is the way it is done: raise the mainsail, raise the foresail, spinnaker out, and so on. Sailing is a sophisticated art indeed. Not the answer you're looking for? Browse other questions tagged idioms phraseology or ask your own question. Full Steam Ahead … malappropriated when applied to Trains? Equivalent of “see in a new light” for hearing? what's the word for a common saying? What's an idiom for missing the obvious? What is the history of “shoot” to suggest “go ahead”?